Brazil’s largest social movement, the Landless Workers Movement (MST), is hosting a massive fair in the country’s largest city, Sao Paulo. 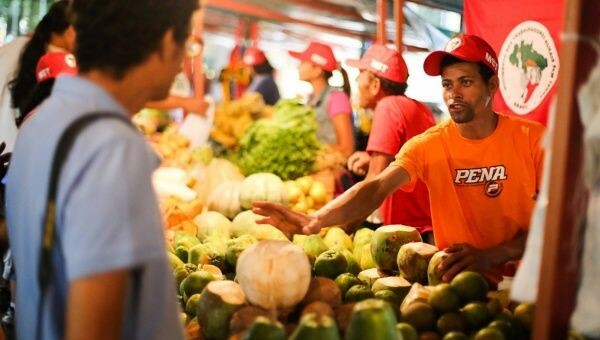 The three-day event, which begins on Thursday at the Agua Branca Park, will provide small-scale farmers from across the country an opportunity to sell food from their respective regions. The three-day event, which is expected to bring in around 250 tons of food produced in MST land settlements, will also include panel discussions on issues such as nutrition, organic food production and alternatives to the current model of industrial agriculture. According to the Brazilian Association of Collective Health, Brazilians consume nearly 7.5 liters of agropesticides per year—the highest per capita consumption rate in the world. Milton Farnazieri, director of MST's agricultural production sector, says the fair seeks to raise awareness around the negative impacts of large-scale agribusiness. "We will try to show society the importance of producing without the use of agrochemicals. Instead, we will provide consumers with knowledge of agro-ecology practices," stated Farnazieri. At least one-third of agrochemicals used in Brazil have been banned in the European Union and the United States due to impact on human health and the environment. Critics argue that efforts to curb the use of agro-chemicals have been undermined by Brazilian lawmakers who defend the interests of powerful agriculture lobby groups. Another key theme to be addressed during the three-day fair is the issue of land ownership. Brazil presents some of the highest patterns of land concentration in the world, with more than 40 percent of land being concentrated in less than one percent of properties. “This is why we oppose large-scale agribusiness and instead we want a popular land reform," said João Paulo Rodrigues, from the National Coordination of MST on Wednesday. Land activists worry that conditions for small scale farmers will worsen under the current government of Michel Temer, whose first actions included cutting off the Ministry of Agrarian Development, and reducing financial resources for emblematic programs in food procurement and strengthening family farming. Meanwhile, according to records from the Pastoral Land Commission (CPT), 1,833 peasants and leaders of the struggle for agrarian reform have been assassinated in conflicts over land since 1985, while during the same period large land estates have grown by 375%. In addition to the discussions around nutrition, agro-ecology and land ownership, the fair will include musical performances from cutting edge artists such as Liniker and latino Grammy award winner Tulipa Ruiz. "I do not want to be lied to by the agricultural industry anymore, or consume poison, I want to understand where my food comes from. And as a consumer and citizen, I have the right to choose food that does not harm my body or the land from where it comes from," Ruiz stated leading up to her performance. The event will also involve a series of presentations, which will be given by prestegious authors, academics, social movement leaders including a MST national coordinator, João Pedro Stedile along with the former President of Uruguay Jose Pepe Mujica.